As the battle over cybersecurity heats up in Congress, privacy advocates today launched a legislative ‘scoreboard’ that grades lawmakers on their commitment to surveillance reform. 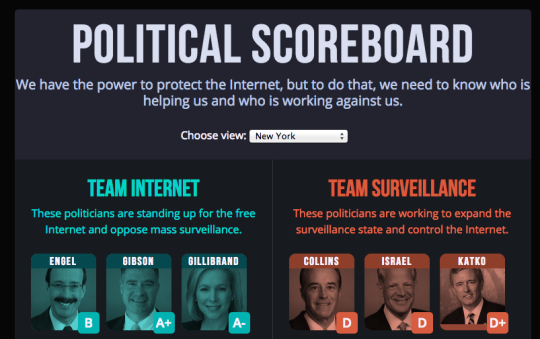 The scoreboard builds off a similar tool released last year by a coalition of privacy advocates, adding data from the current Congress, including the PATRIOT Act renewal fight, the USA FREEDOM Act of 2015 and other relevant legislation. “We wanted to develop something simple and easy that would allow users to quickly see which politicians oppose mass surveillance, and who’s working to expand the surveillance state” says Alex Marthews, national chair of Restore The Fourth. The new online tool, which is a joint effort by Restore The Fourth and Fight for the Future, allows users to input their state and find their legislators’ voting records. Visitors to the site are encouraged to call, email or Tweet lawmakers to demand stronger surveillance reform. All 535 members of Congress are graded. 24 Senators got A grades, and 35 got Fs. In the House, 173 Representatives (40%) got A grades, and 10 (2.3%) got Fs. The scoreboard shows strong support for surveillance reform in Congress, especially in the House; but that leadership in both Houses and the intelligence committees are strongly slanted against reform. Looking at the states, legislators from Colorado, Hawaii, Massachusetts, Tennessee, Utah and Wisconsin are most supportive of surveillance reform, while legislators from Alabama, Arkansas, Illinois and Mississippi tend to oppose reform more. With so many key elections coming up, this tool provides a platform for voters to get involved. As Congress prepares to make decisions affecting the nation’s privacy and safety, we should all be aware of who is and isn’t fighting for our Fourth Amendment rights.